Regardless of what it is that often drives us on the hunt to gain the clarity and assurance that what we're reading or hearing is actually not just a figment of our imagination, we use and develop a skill that is more useful than for just text messages, but Bible reading and studying too! When reading Scripture, we can tend to gravitate towards the chapters and verses that are most familiar to us. We tend to think books like Leviticus are totally off limits because of the detailed Laws and run in hot pursuit to our favorite Psalm or Proverb for encouragement. But, what we often don't realize, that by spending time in those passages that we often steer clear of, we are submitting ourselves to The Spirit's work Who makes Bible reading and studying possible. And even better, He through His divine power, works within us, to make God-breathed Scripture, illuminate to the hearer and reader that meditates on His Word, day and night. Repetitive Scripture reading trains our eyes and ears, to notice the various nuances of the text. When we engage with a fresh reading of a text for the first time, our minds are getting adjusted to unfamiliar territory. Our senses seem to be heightened to an extent to notice certain words and phrases, but we often miss certain key things that we would only gain through a second reading. It's similar to driving to a new place you've never been before. Upon first following the GPS around to navigate to that new Starbucks you've never been to, you're not really focused on noticing the Target on the way there, because finding Starbucks is your focus. But, once you become familiar with the route on your next visit, the easier it becomes to mark other landmarks nearby that you weren't aware of on the first trip. The same thing goes for training our eyes to notice the repeated words and phrases, words that pop out that we read in other books of The Bible or even the verses we've quoted for years, but didn't quite realize the context of. (1) It reminds you that through The Holy Spirit, you can understand Scripture without needing your Study Bible or concordance beside you. (2) It helps you to gain context of that overall text, which helps you guard yourself from reading yourself into the text before first finding out who it's directed to/what it's essentially about. By devoting our time to walking through The Scriptures slow and steady, understanding that we're not trying to meet any quotas of how much we read in one sitting, we will walk away with so much more understanding and insight on what it is that is actually being communicated in the texts we read. The more we get familiar with repetitively reading our way through Leviticus for example, the more we will notice the Target stores and nail salons and street signs and such, on the way to our destination. One of my favorite ways to get into The Word and make the habit of repetitive Scripture reading apart of my day, is by listening to The Bible on audio. God has chosen and ordained for the hearing of The Gospel proclamation, to be the means by which He saves. And because He has, as Believers, we can experience something unique when we listen to The Word of God be read to us, whether it be on audio, in a Sunday sermon or even as we sit in community with one another and read The Bible together. 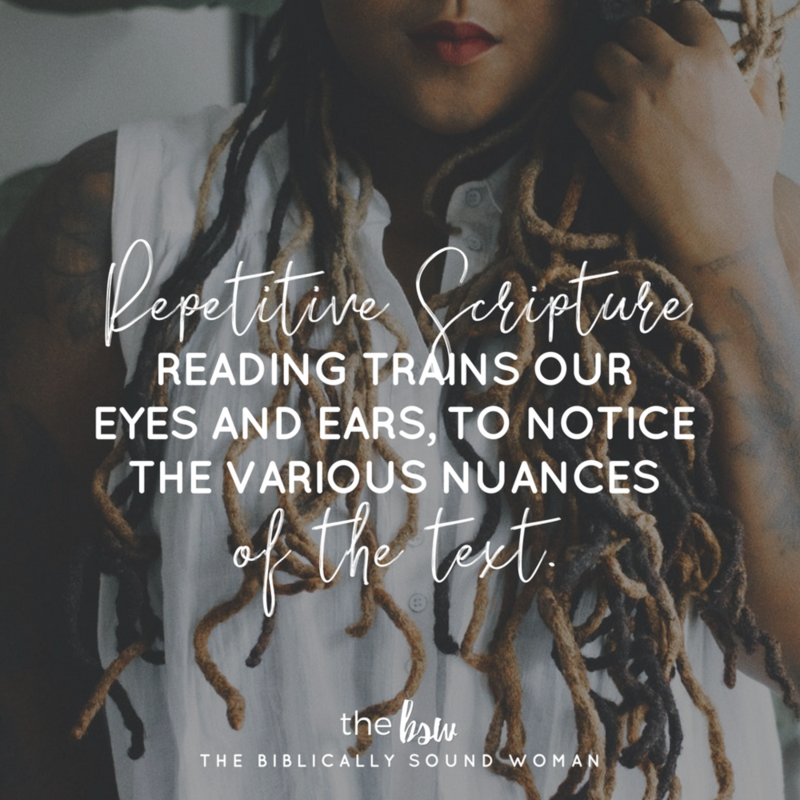 Repetitively listening to The Word, can especially be helpful for those of us who get distracted easily when reading or even for those of us who learn better through auditory exercises. When I'm not able to physically sit down in front of my Bible or even when I'm cooking or driving, I find it extremely helpful to listen using the YouVersion Bible app, read Scripture to me in CSB version! Things that I may have missed in my reading/studying time, I then am able to pick up and notice when I listen to the audio. It trains my ears to look for places elsewhere in Scripture I've heard similar words or phrases being used. And through this practice, I'm able to later go and mark in my Bible, cross references that I remembered from other passages I've read or studied in the past. This keeps me on my toes and also helps me to connect the larger story line of Scripture, together after hearing one chapter after another be read. Another cool resource to listen to The Bible on audio is Streetlights Bible! They have an app and website and you can listen for free through their app, on iTunes and their website! They set Scripture reading to music and it's awesome! It's a cool way to hear some of your favorite Christian artists and teachers read Scripture and listen to The Word be read, wherever you are! Ultimately, the triune God meets us in our repetitive reading! Even more than we desire to understand God's Word, He desires for us to us to understand Him, His Word and for us to worship Him rightly. We are not sheep walking through the pastures of Scripture alone. We have a Great Shepherd who surrounds us, leads us and by the power of The Holy Spirit, keeps us from wandering outside of the boundaries that Scripture has marked to keep us on the straight and narrow path. Our goal in Bible reading and studying, should never be to treat it as if it's a race that we need to run in a set amount of time, but instead a journey we should take to savor The God whom it proclaims beautiful truths about, all the more! So, try it this week! Pick a chapter or book of The Bible to read and commit to reading it repetitively and track your progress by taking notes on the new things you observe or begin to understand with each reading! Incorporate the repetitive listening method in as well, and see what nuances you are able to grasp during that time! Encourage your friends or small group to do the same, and discuss what you all learn together!